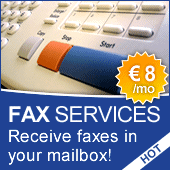 Recently, our Fax2Mail services have become available for every Belgian and Luxembourgian area code. Do you still use a traditional fax machine? Then make sure to check out our online fax services and benefit from many advantages. Not only will you save a lot on communication costs, you will also save paper and thus contribute to the environment. You can even transfer you current fax number to COMBELL without any downtime. Recently, with each fax number, we started to offer 20 euros’ worth of free fax credit. And don’t forget the most important advantage: you’re not bound to your office anymore and can check and send your faxes online and via e-mail, whatever your location.